Learn how to shade dazzling "Gemmy Gems" using colored pencils! Especially for those who love to create doodles and Zentangle®-Inspired-Art. These HIGHLY addictive "Gemstones" are super fun to make! 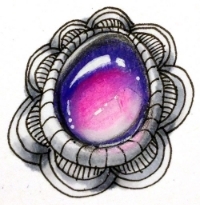 The new drawing/coloring craze: transparent gemmy "Gems". Updated! 52 Pages full of information and incredible tips on how to create GLORIOUS, DAZZLING smooth gemmy gemstones! You'll find MANY tutorials on how to create gems out there, including Youtube. And yet, none of them will offer the detailed information I provide in this ebook. Go check out for yourself! 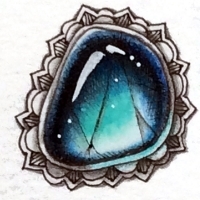 The second updated edition of this ebook has 7 examples, and 2 case studies, including an entirely new version on how to create gems using only colored pencils and white gel pen -- no need for markers! Chris Gerstner, moderator of "For the Love of Tangling" said: I can't tell you how great it was to see all the activity today on the groups! What a great day! It's been a crazy day, but I'm taking some me time and I'm sitting here, reviewing a copy of Eni Oken's new ebook, 3D Tangle: Shading Smooth Gemstones. Right off the bat I'm just going to say....she's done it again! This 43 page, color ebook has got to be the most in depth tutorial you will find on how to go about making these wonderful little Gems. Eni walks you through everything, from the supplies you'll need for shading and coloring, to "the Anatomy of a Gemmy Gem" which really breaks it down into very understandable sections. She then takes you through the process of Shading and coloring Gems from Glassy to Gems with Inclusions - it's amazing the depth of instruction in this ebook. Finally Eni provides you with wonderful examples and leaves you with a few design tips. I highly recommend this ebook to anyone who has been seeing these wonderful gems and would like to learn how to make them. You really can't beat the price - $10 USD. Not only is it thorough, it's easy to follow and understand, plus the examples are a work of art themselves. I'm posting the link again and it will be in the files section along with the other resources that live there. Many thanks to Eni for the many hours she's put in getting this ebook to us so fast!!! Marty Deckel, Deckel Design Studio said: It is with great pleasure that I have the opportunity to review the delightful ebook by Eni Oken entitled, 3D Tangle: Shading Smooth Gemstones. I found it to be an excellent resource that clearly teaches the interested learner how to create rich, vibrant, jewel-toned gemstones. Shading Smooth Gemstones focuses on six detailed, step by step, examples of Eni's techniques for creating, shading, and embellishing gems. She begins the first several pages by listing, with pictures and comments, the best supplies and materials for working with her wonderful techniques. She has very thoughtfully and thoroughly demonstrated and illustrated every aspect of these techniques throughout her 43 page ebook. For example, the page entitled, Anatomy of a Smooth Glassy Gem, illustrates and explains, in depth, the workings of light through a transparent gem; a crucial foundation to understanding the theory behind all of her techniques. Her directions are punctuated with excellent notes on the lighting, shading, and embellishing of each gem style. Overall, her teaching method and attention to detail gives the student the tools and techniques needed to create their own beautiful gemstones. Some of my favorite things in working with Eni's techniques include: 1- adding the color swatches as I worked in order to keep track of the colors and markers I had used. 2- layering and burnishing of the colored pencils, which created a depth and richness of color. 3- using the white pens to add bright white highlights for sparkle, achieving the realistic look of glass gems; shiny, polished and dazzling. 4-finally, bringing them to life with reflections of light and color, shading for contrast, and embellishing with beautiful pattern-oriented bezels. Thank you a million times for your ebook on drawing gems. I watched Youtube videos on creating the gems and felt very lost. Your simple step by step version was phenomenal. I was so pleased with my results. I have Eni Oken book 3D Tangle: Shading Gemstones...until I read that I didn't have a clue! Eni's ebook on gems is amazing. I posted the very first gem I did with her ebook on my Facebook page and someone thought his jeweler friend had posted a photo of an actual stone. I bought Eni's book and found the instructions to be excellent. It's got more than one technique and talks about different mediums. The steps and instructions are wonderful. I'd never tried the gems at all before I bought the book. I wasn't even sure where to start. What shall I say, she did it again. This is BRILLIANT! I think this is my fourth or fifth shading book and while all have been great and helpful, this tops everything in my opinion. I raise my hat to you, Eni, you're the true Queen of Shading for me. Thank you! I love Eni's book. I have bought them all. I too am impressed with the book. I especially like there are alternatives to the given tools shown. The book is great! My gems improved dramatically when I used Eni's guidelines. Eni really walks you through the whole process step by step. I absolutely enjoyed her directions. This was the first e-book from Eni that I've bought. It is great. The $10 for me turns into about $13. with currency exchange.....but totally worth it. I ordered Eni Oken's gem book and repeatedly downloaded them incorrectly, using up my 5 downloads. Eni was so patient and understanding and helped me to fix my errors immediately. A beautiful instructional book, amazing customer service....thank you, thank you, THANK YOU!!!! I love this book! It's so well written and the examples are out standing. I followed the instructions in your super ebook, never thought I would be able to draw gems. Thank you ? I am love your book and look forward to practicing gems! Thanks to Eni Oken for the marvelous tutorial! I LOVE your gem book--I'm so hooked!!!! Thank you Eni Oken... thanks for your great e-book! I have all your printed books! You are the best teacher ever! Thank you Eni...your gemstone-ebook is fantastic. Eni, you are a phenomenal teacher. Hi Eni, I just bought your ebook Shading Gems. It's beautifully done. Eni Oken's (gem) book (PDF) is fabulous. I read and followed instructions in your ebook Shading Gems. Couldn't have done this without you! EVERYONE should get your book! It's crystal clear and easy to understand. I've never even used a colored pencil! Wonderful eBook!! Can’t wait to try your techniques…..very well done. Thank You! Thank you so much, Eni! I'm having a wonderful time learning about the Gems, and everything else you share. You're an inspiration to so many! Love the new gem instructions, Eni Oken, clear, concise and great immediate results!!!! Your updated book helped a lot. I'd been using black colored pencil in the back, but was being way more timid with it. This is one of the best gifts I ever got myself. Thank you so much Eni! Your directions are perfect and easy to follow! I'm new also and a few people told me to get Eni Oken's books. I did and it really helped get me started in doing these. Thank you for the link to the latest book update. I am finding your book invaluable in helping me to draw my gems. YES!!!!!!! Thanks ever so much, Eni for your fabulous eBook. The update was just what I needed since I'm a pencil gal. I am thrilled!!!!!! A lot of work went into this book. Very impressive! I can recommend books by Eni Oken Czt. 3D Tangle Shading Gemstones and many others. I have a few of her books, but haven't started on the Gemstone one yet. Learn to create your own dazzling "Gems"
Three gray markers: light, medium and dark. Note: If you don't have gray markers available, you can still complete the exercises using TWO alternate options: inking pen or using only colored pencils. For a complete list of my favorite supplies and brands, visit my Shading Supplies page here. I recommend good black and white shading skills before tackling this book! Learn more about B/W shading here. This ebook is only available in print through this link, not available anywhere else! Just to let you know (in case it doesn't show up anywhere electronically) your inspiration has travelled all the way to The Blue Mountains in Australia which is where I live. I enjoy greatly your ebooks, in fact it was the first ebook I have ever purchased. The emails are also a treat. Look forward to my videos and future surprises. What content was updated in the new edition? If you printed out the first book and want to add the new pages to your print, then make sure to print our EXAMPLE 01 (pages 12 through 18, entirely new) and CASE STUDY 01 (pages 31 and 32, entirely new). Optionally, you can also print Example 02 (used to be example 01, now with new comments and tips, pages 21, 22, 23, 25 and 26). A few typos and comments were added to the rest of the book as well, but they are not major. This ebook is not a video. You must be familiar with some basic drawing skills such as ink line drawing. It's here - the Shading Smooth Gemstones ebook!